Union Pacific Corporation owns one of America’s leading transportation companies. 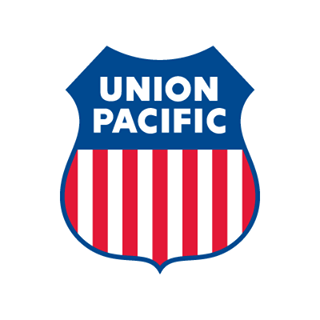 Its principal operating company, Union Pacific Railroad, links 23 states in the western two-thirds of the country. Union Pacific serves many of the fastest-growing U.S. population centers and provides Americans with a fuel-efficient, environmentally responsible and safe mode of freight transportation. Trains carry nearly everything families and businesses depend on – raw materials such as lumber and steel, chemicals to purify drinking water and finished goods such as TVs and refrigerators. Railroads haul America’s food supply, 70 percent of U.S.-produced automobiles and 70 percent of the coal that produces more than half the nation’s electricity. Union Pacific emphasizes excellent customer service, offers competitive routes from all major West Coast and Gulf Coast ports to eastern gateways, connects with Canada’s rail systems and is the only railroad serving all six major gateways to Mexico, making it North America’s premier rail franchise.